It’s not black and white …. The NEW release for Glamistry is called ‘Camilla’. Superb detailing as always! With a deep, eyeleted sole and stiletto base this is a substantial shoe . Yet it is light and elegant looking because of the upper design. The upper consists of superb lacing and knots which are accented with two leather tabs on each shoe. The lacing carries up to wrap the ankle, where a tassled lace bow secure the shoe. Once more, a clever design keeps the balance and overall look of the shoe light and chic!! 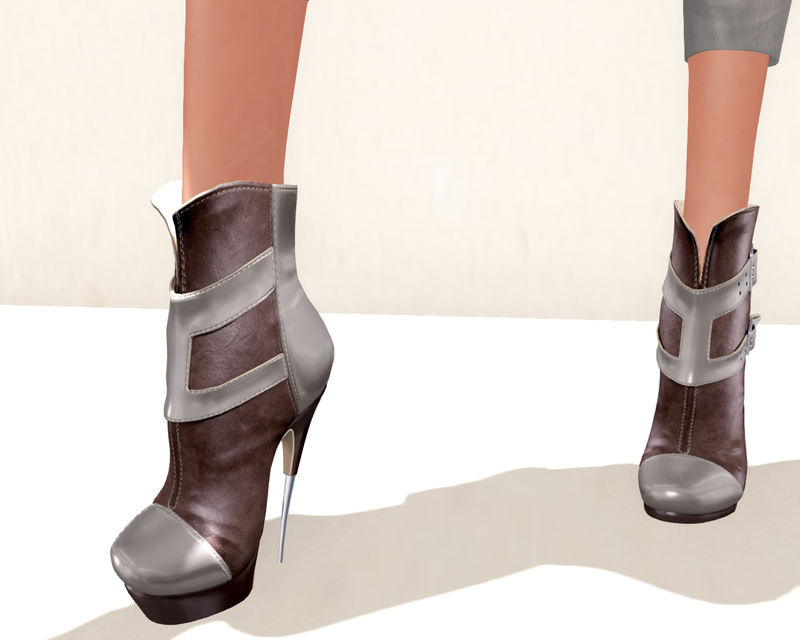 Heels for Slink / Belleza / Maitreya. HUD driven colour change in four different shoe areas – 2 distinct shoe areas on upper ( ties and straps) , heel, metals and sole. With 12 colours to choose from !! They’ve done it again, with these ‘ANEMUNA’ shoes by Glamistry. Just look at the detailing… The heel has a metal zip; which is finished with a metal pull button. Leather ties and strapping form the shoe upper into a sandal style. The strapping, stiletto and tie loops also have metal studding, taking the shoe to another level. I would like to draw attention to the elegantly platformed sole. This clever design keeps the balance and overall look of the show light and chic. No matter what angle these shoes are looked at from ….they rock!!! When Gizza and Glamistry teamed up for this incredible ‘Peony’ outfit, magic happened this set makes looking so cool so easy! Gizza has given us a halterneck top, beautifully crafted in leather with superbly detailed corset belts at the front contrast the seductive low back. Trouser/Skirt is also made with same leather texture and the colour pallete are mixed in this photograph. Peony is availabe in White, Red, Gray,Black, Camel and Burgundy. Comes in 5 standard mesh sizes and works on Maitreya, Slink hourglass and Physique.